As promised I have created a tutorial to demonstrate the 'join-as-you-go' granny square joining method I used in my Rainbow Disco Blanket. 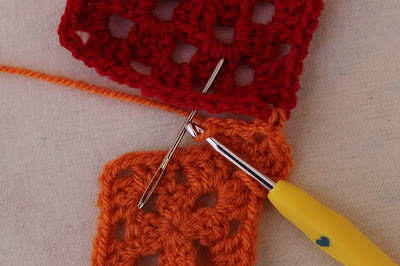 This joining method is fantastic in that it is much quicker than joining your squares at the end by slip stitching or sewing. More importantly for me if you are joining a you go along you are able to see your blanket emerge before your eyes, giving much needed motivation to finish. This method is not only for blankets, I also used it on my vintage tea cosy and hot water bottle covers which you can find on Ravelry by clicking through here. One caveat though is to be careful if you are making a very large blanket as the weight of the wool will pull on the joins. 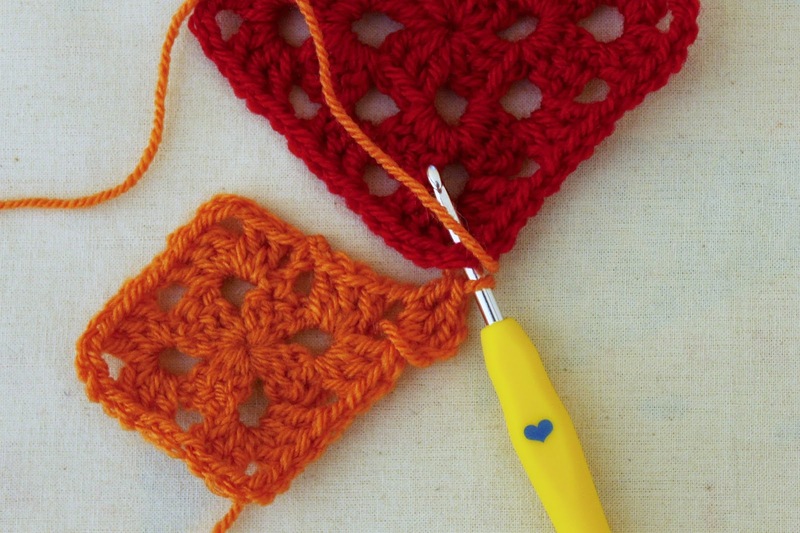 Instead use a more secure fastening such as double crochet or hand-sewing. I have also produced a downloadable PDF of this tutorial which you can find under my tutorial tab here. 3) It is easiest when you are first learning this method to start with a corner. 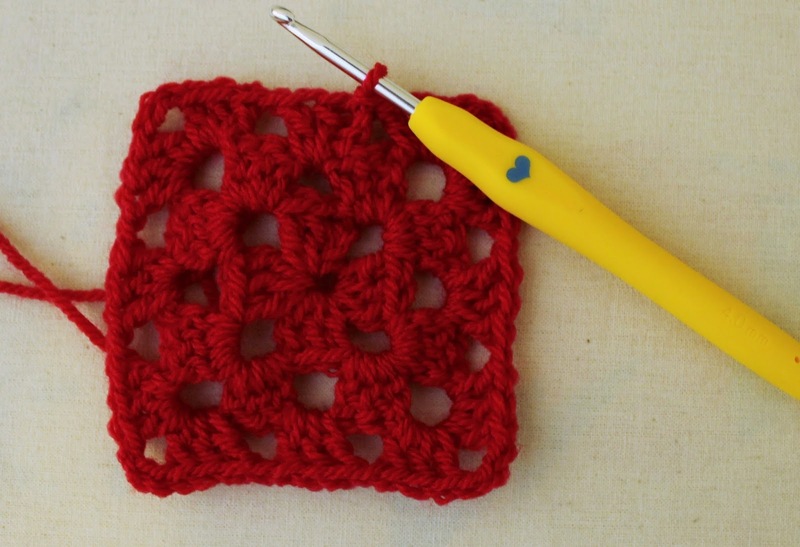 As you get more experienced you will be able to start anywhere along the granny square and know exactly where to put your hook for the join. 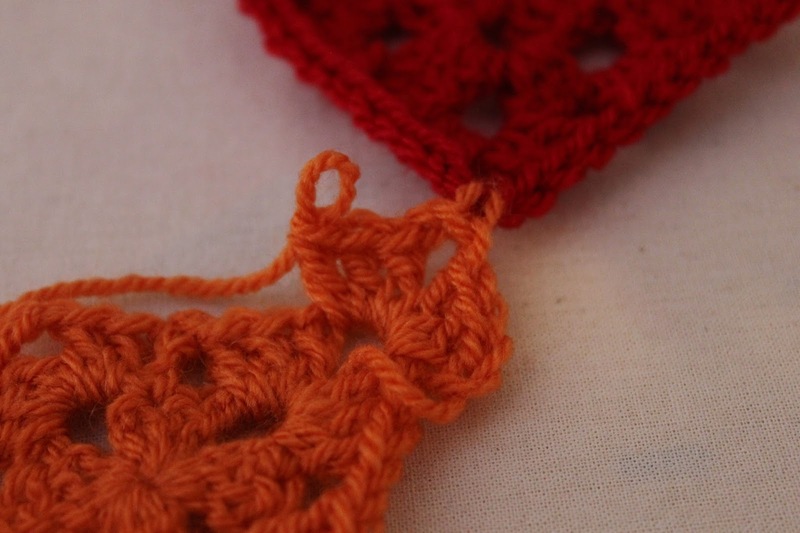 Join on your yarn and make your first 3-treble cluster of the corner. 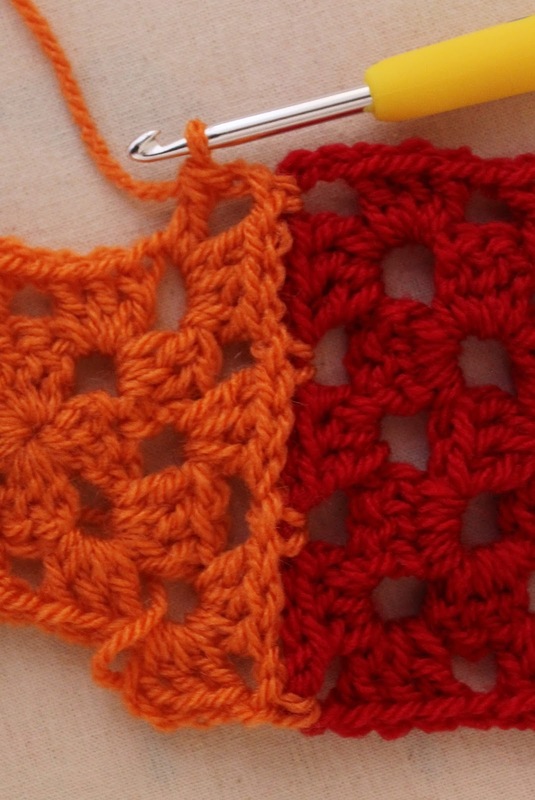 Usually if you were making a granny square you would make three chain stitches then your second 3 treble cluster. This time however you will make your first of your three chains as normal and INSTEAD of the second chain make a DOUBLE CROCHET (UK terminology) into the corresponding 3-chain space of your FIRST granny square. Make the third chain stitch as normal followed by the second 3 treble cluster to finish the corner of your second granny square. 4) So now you have joined your first corner you need to join along the edge. 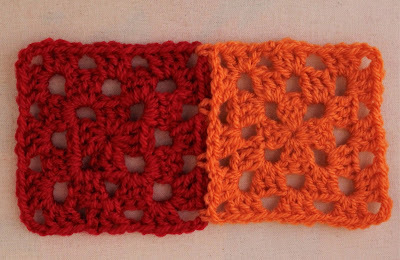 To do this, make your next stitch a DOUBLE CROCHET into the 1-chain space between the treble clusters on the edge of your first (red) square as shown by my needle on the second image below. 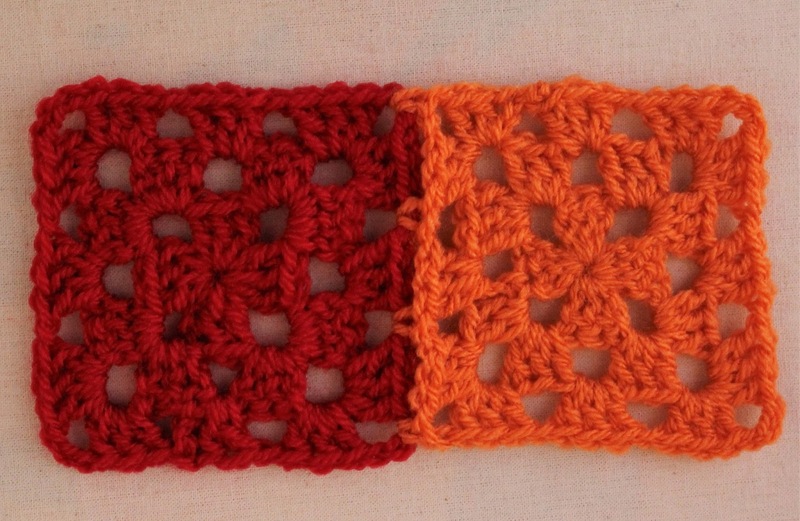 …..Then make your three treble cluster into the next 1-chain space on your second (orange) square. It will look like this…..
5) Repeat step 3 for the second corner, making your middle chain of your three chains of the corner a double crochet into the corner of your first square. 6) Complete the final round of the second square as you would normally for a granny square. Voila! You have your first join. 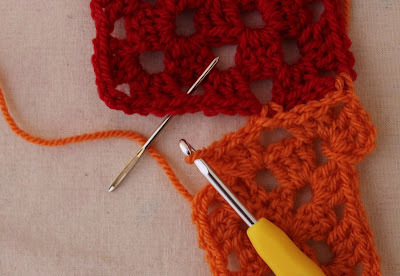 This becomes a bit more tricky when you are working a blanket rather than just strips of squares as some squares you will have to join on both sides. Once you get going though I am positive that you will love this technique! If you do use this tutorial please let me know how you get on and show me your projects!